Perch PJ est une belle trois chambres, trois salles de bain cabine située à quelques minutes du quartier commerçant de Eureka, restaurants et attractions. Situé sur une rue sans issue, ceci, maison privée tranquille a beaucoup de stationnement hors rue, assez pour une remorque de bateau ou jet-skis chambre. Vous à l'intérieur de la perche, un grand de pierre, cheminée à gaz accueille asseoir et de rester un certain temps. Joliment décoré dans un thème de chalet de pêche rustique, les chaises en cuir ailes à des créances et la main de table sculptés invitent à la détente. La cuisine entièrement équipée comprend cuisinière et four, micro-ondes, lave-vaisselle, cafetière et tous les plats, ustensiles de cuisson, casseroles et poêles, linge de maison dont vous aurez besoin. Draps, serviettes de toilette sont inclus. Il ya des thés, café, chocolat chaud et du maïs soufflé pour votre plaisir. TV par câble et d'un lecteur DVD et une connexion Wi-Fi inclus. Le pont arrière a beaucoup de sièges avec une table. Asseyez-vous et siroter un café tandis que les cerfs traversent la cour arrière. Le bain à remous est en attente pour vous de profiter, et peut accueillir 5. Il est un charbon de bois barbecue Weber, si vous décidez de griller. Votre famille furry va profiter de la grande cour arrière clôturée à errer ... plus de 1/2 d'acre. Apportez votre bateau ou jet-skis. Lacs Beaver et Table Rock sont à proximité. Des sentiers de randonnée sont à proximité et de nombreuses attractions pour garder un occupé. La plupart de nos clients sont des clients réguliers. Ils reviennent année après année. Nous espérons que vous apprécierez notre cabine, aussi bien. Tous les draps, les produits en papier, détergents, thés, cafés, chocolat chaud, pop-corn fourni. Il ya une bibliothèque de vidéos et de jeux de société pour tous les âges. We were pleasantly surprised when we pulled up to the cabin. It is Super Cute on the outside!!! Great curb appeal. The place is huge! 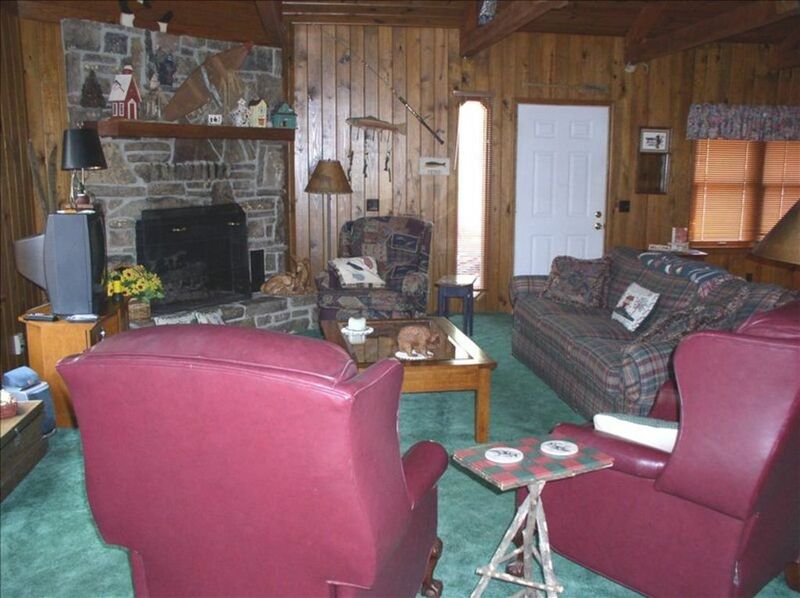 The pictures on this website do not do this house justice. The place is very clean and is stocked with everything one could ask for and one thing we thought was a nice touch was all the candles sitting around that we could light. They had decorated a little for Christmas with the tree and some garland which added to our festive mood. Hot tub works and is hot which is great for enjoying the outdoor air. Backyard is huge and our dogs absolutely loved running around....it truly is like a little dog park. The house is secluded but you do have a neighbor that you can see from the backyard but it is very far in the distance so you really do feel secluded with all the trees. Fireplace is great! Place is very quiet. The basement is like an apartment all in it's own except lacking a kitchen. I highly recommend this place. We did not want to leave and plan to be back in the spring. Worth noting: we did not see any bed bugs and we looked everywhere!! Home lay out good for fmly gathering. Shower faucet needs improvement. Fireplace, kitchen,& fenced yard hot tub all nice. BED BUGS found, both dead and alive!!!! Chair near fireplace - live bed bugs. Masterbath dead bedbugs. We packed up and left. Very worried we will be bringing some home. Will need to wash and dry clean all clothes, and groom dogs! What a bothersome and costly chore! I'm sorry your stay wasn't pleasant, but I was sure you stayed the entire reservation. Many, many vacation rental homes and hotels in Eureka Springs, have had a terrible issues with bedbugs. We do the best we can, with direction from our pest control company. The people prior to and after you had no complaints. We also offered to help pay for your expenses. Again we are sorry. Great little cabin/house! Very clean. We had a problem finding the house because of the numbering system of the houses of this street. We pulled a 20 ft trailer so it was a bit cumbersome to park the trailer until the owner gave permission to park it on a grassy part of the yard. The house had excellent accommodations. We always desire 2 king beds with separate bathrooms when we take vacation with another couple. This rental fit our desires excellently. We were not able to stay the whole time due to a family emergency. If we were to travel to Eureka Springs, again; we would attempt to rent the property again. Thanks, Pam. Great property - would definitely stay again! We spent a four day weekend at this property with two other couples. It was perfect for three couples, with three large bedrooms, three full bathrooms, and plenty of room. The house is very well stocked with anything you could possibly need. We sat on the deck drinking coffee in the mornings and watched the deer roam across the property. Thank you for sharing! Guides disponibles à la location de pêche. Les massothérapeutes qui viendront à la cabine pour une expérience confortable.